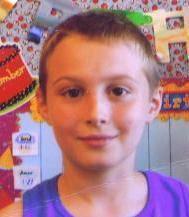 Logan Cosumano, 11 years old, 4-10", 85 pounds, brown eyes, blonde hair, was last seen around 4:30 Wednesday afternoon on Great Rd. in Maple Shade. He was wearing a red and black windbreaker, tan shorts and white socks with no shoes. Contact the Maple Shade police department with any info at 856-234-8300, or 911. Call police with any information at 856-234-8300 or 911.